I would like to ask for best solution for my issue. I need high side switch for 24VDC 6mA (it is enable signal for a device). This device I want to control by Arduino (input 5 V 20mA). What is the best solutions for this low current? I tried to use Sziklai pair, but PNP transistor is still open. I don't know how to calculate resistors between NPN and PNP :-(. Do I have to use a sziklai pair or is there something else? Start by working back from the output. 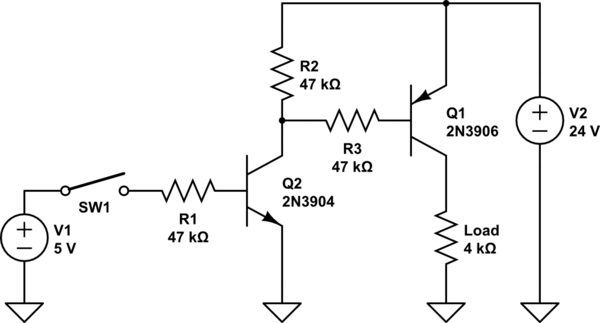 Collector current is only 4mA so suppose we allow base current to be Ic/Ib = 10 or 400uA. That will ensure it is well saturated. So R3 should be (24V - 0.7V)/0.4mA = 58K, so you can use 56K. R2 is just to take care of leakage in Q2. It is 50nA maximum at 25°C. If we assume operation to 95°C and doubling every 10°C then we have to allow for 6uA. If the base-emitter voltage of Q1 should be less than 300mV with 6uA of leakage, the R2 should be 50K or lower. We can use 47K for R2. Might as well make R3 47K too and keep the values the same. Collector current of Q2 is about 0.5mA. If we use the Ic/Ib = 10 again, and assume it should work with 4V input, then R1 <= (4V-0.7V)/0.05 = 66K. We can use 47K again and keep all three the same. Your circuit should work fine, although I have a couple of minor objections to it. However, the main reason for this answer is that you got outright bad advice in a comment. No, you don't want to connect the emitter of Q2 to the output. That would make the whole pair a emitter follower, which would only allow the load voltage to go to about 4.3 V, not the 24 V supply. There is no place in engineering for knee-jerk answers and blind application of "rules" without actually understanding the reasons. The main difference is that Q2 is now a voltage-controlled current sink. The digital signal can directly drive the base of Q2, and the output of the current sink (the collector of Q2) can be tied directly to the base of Q1. The load will draw 6 mA. Let's say Q1 can be counted on to have a gain of at least 50. That means its base current must be at least 120 µA. R1 will also take some current. Let's say worst case the drop on R1 is 750 mV, so the extra current needed for R1 is 75 µA, for a total of 270 µA needed to turn on Q1. When the base of Q2 is driven to 5 V, there will be about 4.3 V across R3. Most of the current thru R3 will come from the collector. We need this to be at least 270 µA, so R3 must be no more than (4.3 V)/(270 µA) = 16 kΩ. The value of 10 kΩ shown above leaves some margin. Working forward, we have about 430 µA thru R3. 75 µA of that comes from R1, with the remaining 350 µA or so from the base of Q1. This means we require Q1 to have a minimum gain of (6 mA)/(350 µA) = 17, which is well within the capability of many small signal PNP transistors. How to drive a 9V common cathode 7 Segment using Arduino and transistors?